CUSTOM FIT Clear acrylic case for coins 1.5" diameter and up to 3 mm thick. CUSTOMERS SAY: Clear, smooth, elegant case! | Finally a case as cool as my coin! | Best Coin Case! Looking for the perfect display case? There's no better way to highlight your collectible than the CoinedBits® custom molded display case. Uniquely designed to stand freely on your desk, shelf or any flat surface, our case provides a crystal clear, unobstructed view. Please check your item's size as this is not an adjustable case and we'd hate for it to arrive and not fit your collectible. Our four magnetic fasteners sit flush--eliminating any visual obstruction-- & adhere strong, safely securing your treasure inside while still allowing you to open & close with ease, & without tools or hex keys. The case is solid, sturdy, strong, & perfectly sized to stand alone without tipping or being easily knocked over. All CoinedBits® custom display cases come packaged with protective film to prevent scratching during transit, ensuring you receive a blemish free display case. 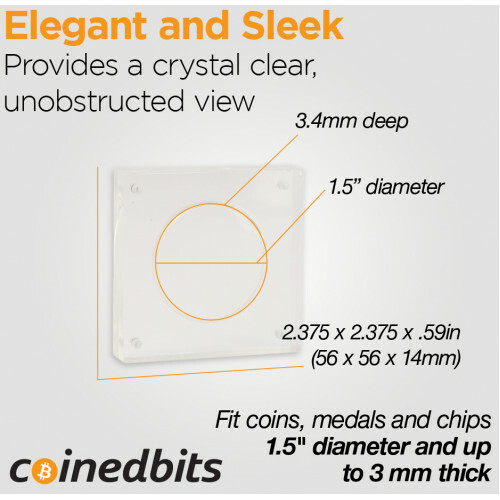 CoinedBits® has been creating high-quality coins, display cases and Bitcoin collectibles since 2010. To see our full product selection, visit our CoinedBits® Amazon store. All CoinedBits® products come with a 100% Satisfaction Guarantee. If you're not happy with your purchase, just send it back and we'll refund your money. So what are you waiting for? 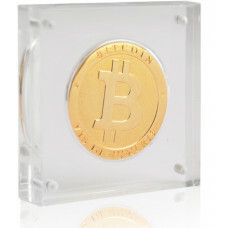 Order your CoinedBits® Custom Display Case today!